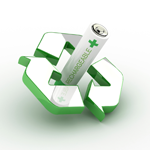 McCourtney Road Transfer Station and Recycling Center is proud to continue their sustainability efforts and support for the environment by responsibly recycling rechargeable batteries and cellphones through the Call2Recycle® program. Drop off your batteries today! Don't forget to tell your friends and family that McCourtney Road Transfer Station and Recycling Center accepts rechargeable batteries and cellphones for recycling.